Due to director Feng Xiaogang’s (馮小剛) repeated collaborations with veteran actor Ge You (葛優), the leading ladies in Feng’s films have often found themselves with the short end of the stick: not only do they attract less media attention, they are also subject to more pressure, especially younger actresses whose stardom are still on the rise. However, 29-year-old Bai Baihe (白百何), who stars opposite Ge You in the recently released Personal Tailor <私人訂製>, shared that she felt completely at ease despite filming with such big-name costars. Since Personal Tailor is distributed by Huayi Brothers, many fans expected that the role of the female lead would go to Huayi favorites like Li Bingbing (李冰冰) or Yao Chen (姚晨). Rumor was that Feng originally wanted to cast Fan Bingbing (范冰冰) as the female lead, but Huayi’s top executives objected to using an actress under another company. But the part ended up going to 18 Artist Management’s Bai Baihe, whose only claim to fame at the time was the 2011 romantic comedy, Love is Not Blind <失戀33天>. In a recent interview, Baihe shared that she likely landed the role only because she had appeared in the 2006 mainland Chinese drama, Bloom of Youth <與青春有關的日子>. The series was an adaptation of a novel by Wang Shuo (王朔), who penned the screenplay for Personal Tailor. 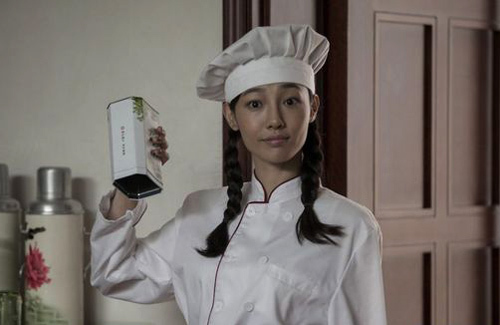 “Perhaps I played the Beijing girl so well in my very first acting role, that [they] decided to use me,” she said. Baihe also related the story of how Feng Xiaogang had approached her to play the part. After bumping into each other at director Teng Huatao’s (滕華濤) wedding, Feng told her that he was filming a movie the following year. “I’d met [him] before and knew him, but we weren’t that familiar,” said Baihe. “I thought he was joking, so I just said, ‘Okay.’” She thought that was the end of the conversation, but one day, a company employee informed her that Feng Xiaogang had called to confirm her filming schedule. Personal Tailor, which tells the story of how a wish programmer (Ge You), atmosphere designer (Bai Baihe), dreamland constructor (Jacqueline Li), and spiritual anesthetist (Zheng Kai) join forces to interpret and realize other people’s dreams, opened in theaters on December 19.